If you want to visit Queen Mary Falls or drive the Condamine River 4WD track, then we think the best place to stay is the Queen Mary Falls Caravan Park. We discovered this little gem on a road trip a few years ago and it has been on our list of places to stay since then. Located about two hours drive from Brisbane or the Gold Coast this lovely little park covers all bases, accommodation wise. To the right of the entrance way, there is a huge grassed area which is perfect for setting up your tent or camper trailer on. The area is nice and level and there are plenty of shady trees around. We chose a nice quiet spot close to the boundary fence. There are fire pits dotted through out this area. We love a good camp fire and as it can get pretty chilly at night time, even in summer, being able to have a fire is a huge plus for us. Fire wood is available from the office for $10 a load. For this we got more than enough to last us the evening. 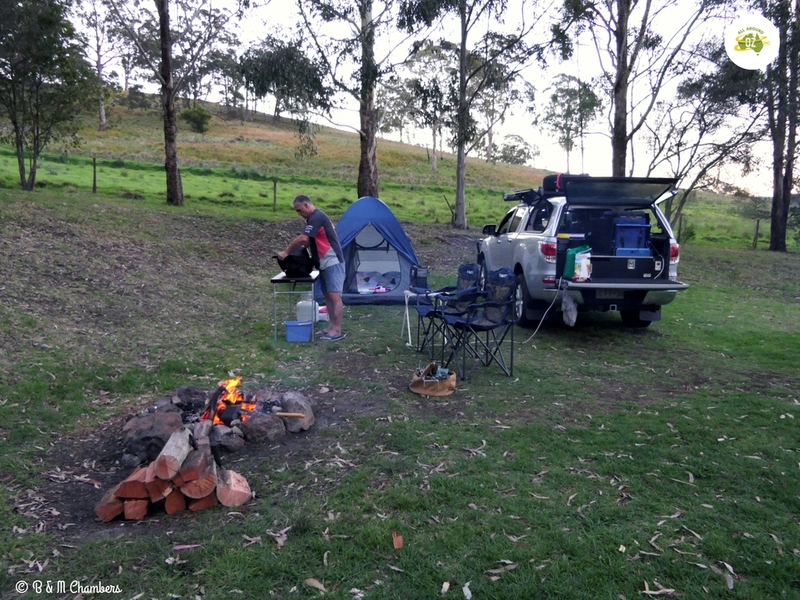 There is plenty of room to set up camp at Queen Mary Falls Caravan Park. Just below the grassed area is the camp kitchen. It has a barbeque, fridge, microwave, large double sink, a kettle and toaster. It also has two large timber picnic style tables and a wood heater which makes it the perfect spot to gather in the evening. Queen Mary Falls Caravan Park has a nice tidy camp kitchen for guests to use. Queen Mary Falls Caravan Park have a number of powered sites available as well as several cabins. The cabins looked really lovely and when I stole a peak into one they appeared to be clean and well equipped. Some have en-suites and some you use the park amenities. The amenities were older style, but again exceptionally clean. I am always happy if there is plenty of hot water and decent water pressure! There are several powered sites and some nice tidy cabins at Queen Mary Falls Caravan Park. At the front of the park is a small shop and cafe. This is also where the office is. The cafe offers light meals, Devonshire teas and coffee. Drinks and ice creams are also available as well as souvenirs. There is a lovely shady verandah and you will be guaranteed of getting a visit from the resident birds. The trees at the front also have some rather quirky decorations. 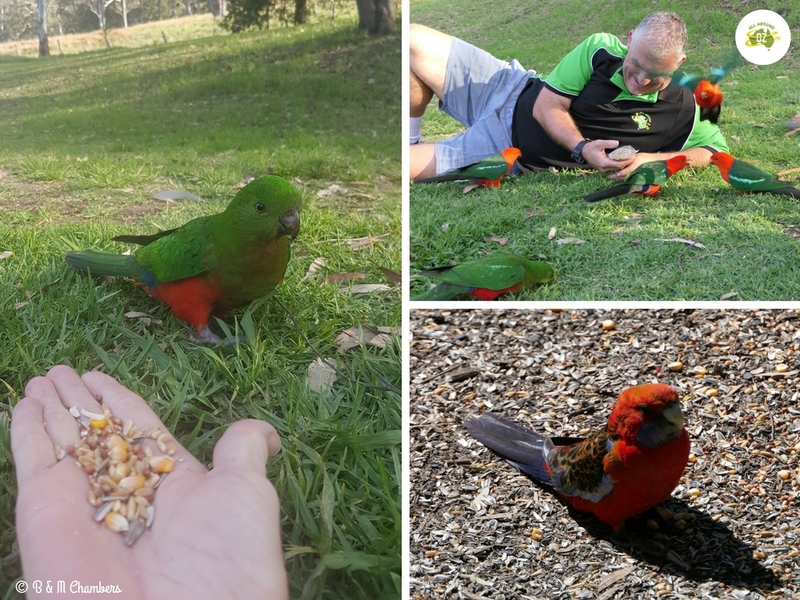 No day at Queen Mary Falls would be complete with out a visit from the local Australian King-Parrots and Crimson Rosellas that abound in the area. They have been a fixture in the park for many years and visit each campsite of an evening to see who has seed for them. A couple came in and landed on Brenden’s shoulder and head without warning so we made sure to have some seed for them the next evening and they came en masse. They were curiously gentle when taking the seed from us. One was clearly the boss of all the others and would hunt them away if he wanted more. We were told that it was breeding season so the males were slightly more aggressive than normal. The male and female of the Crimson Rosella are the same colour wise, where as the female King-Parrot is mainly just green so easy to tell them apart from the males. The male King-Parrots are very sociable, whereas the female and the Crimson Rosella are more timid. As the sun started to set, they all flew off to find a roost for the night, leaving us slightly in awe of their vibrancy and noise. A great experience to have. Feeding the birds that come in of an evening was a highlight of our stay. Any time of the year, Queen Mary Falls Caravan Park would be the perfect place to stay. Summertime the temperatures are usually a little cooler than on the coast. Wintertime it can get quite chilly so make sure you pack plenty of warm clothes. Even in early November we found the evenings a little cool. For more information or to book your stay you can visit the Queen Mary Falls Caravan Park website HERE. Thanks for all the info on this caravan park.As you say, this park covers all bases, accommodation wise. It is always great to have a recommendation of where to stay. We would happily stay there again. We love anywhere that we can have a camp fire!